Breitbart News spoke with Pamela Geller, president of the American Freedom Defense Initiative and blogger at Atlasshrugs.com, about her recent “Draw Muhammad” free speech art exhibit, which came under attack by Islamic radicals on Sunday in Garland, Texas. Geller discussed how much of the political left, Islamic totalitarians, and even some high-profile conservatives have attempted to equate her art exhibit with the actions of the AK47-weilding Islamic terrorists, who were shot dead in their botched attempt to commit mass murder. Geller talked about why drawing Muhammad is so controversial within Islam and how the media is capitulating to Sharia law in America, among other issues. Throughout the interview, view a selection of submissions to the “Draw Muhammad” contest. Breitbart News: Many in the mainstream media have alleged that you crossed the line when it comes to free speech, and that you are responsible for inciting the terror attacks against your “Draw Muhammad” event. How do you respond to these criticisms? Pamela Geller: We incited no one. We didn’t call for violence, justify violence, or approve of violence. 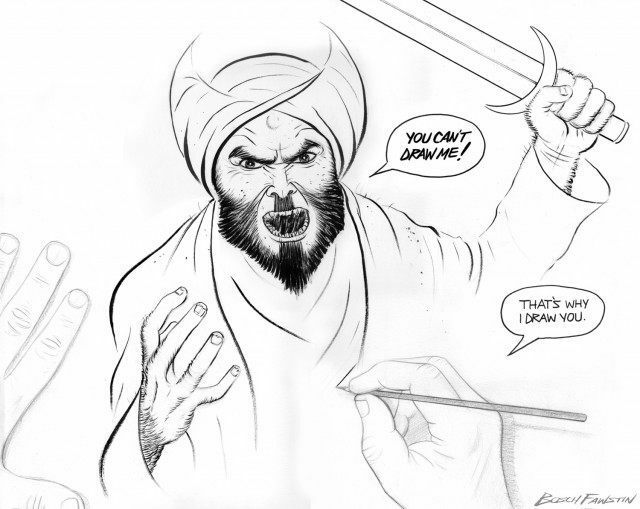 The people who were inciting were the ones saying that we should be killed for exhibiting Muhammad cartoons. There is no automatic or unavoidable response to being insulted. No one is forced to kill for being insulted. Those who choose to do so are responsible for their actions. No one else is. Breitbart News: Even some conservative columnists and a potential presidential candidate (Donald Trump) have resorted to personal attacks against you as a preface before arguing in defense of free speech. Why do you feel that so many have come to attack the messenger? Pamela Geller: This is the problem with the conservatives. This is why we can never nominate qualified, brave, true conservative candidates. The conservative movement has trimmed to accommodate the leftist media so much that they’ve trimmed themselves out of principle. They attack me because they’re desperately afraid that the leftist media will smear them by association with me. It is an act of sheer cowardice. Breitbart News: In a recent presentation you gave at NYC’s Brooklyn College, Muslim student groups attempted to shout you down and prevent you from speaking. What does that say about the state of affairs on college campuses today? Pamela Geller: College campuses today have become centers of leftist indoctrination and propaganda, on which thoughtcrime is severely punished. Anyone who thinks they are still centers of free inquiry and genuine discussion is deluding himself or herself. Breitbart News: In their condemnation of the jihadi attack in Garland, Texas, groups such as the Council on American Islamic Relations (CAIR) seemingly equated your free-speech advocacy with the terrorists’ attempted mass murder. What do you believe motivates their campaign to delegitimize your work? Pamela Geller: Hamas-tied CAIR and other groups like it relentlessly defame and demonize not just me, but anyone and everyone who dares to say a negative word about jihad terror. They are trying to delegitimize and destroy anyone who resists jihad terror, and to show others that the same fate awaits them if they dare step out of line. Breitbart News: Does the Left apply a double standard when it comes to criticism of Islam and its reporting on the events that unfold in the Islamic world? Pamela Geller: Certainly. It is a matter of policy: several years ago I wrote an article about how the Society of Professional Journalists issued guidelines after 9/11 that forbid journalists from any reportage that would associate Islam with jihad terrorism. They always report on jihad attacks as perpetrated by “militants,” “insurgents,” and the like, and do all they can to obscure the Islamic ideology and motivations of the perpetrators. Breitbart News: What in Islam makes it so controversial when one draws Muhammad? Pamela Geller: Islam forbids representation of the human form as idolatry, and particularly of Muhammad, who is considered to be the perfect man. Supposedly if Muhammad were represented, Muslims (and others) would be tempted to worship him. This argument is absurd, of course, for if it were true that seeing Muhammad would tempt one to worship, the early Muslims would have all become idolaters when they saw Muhammad. In any case, the representation of Muhammad carries the death penalty in Islamic law. Breitbart News: What is Sharia Law? What do you mean when you allege that individuals and groups are enforcing the Sharia? Pamela Geller: Sharia is Islamic law, considered by Muslims to be the law of Allah, and encompassing every aspect of human behavior. It forbids criticism and mockery of Islam on pain of death. Thus when Western non-Muslims say we should not draw Muhammad, they are recommending that we conform to Sharia, which Islamic supremacists wish to impose upon us. Breitbart News: What is Islamophobia (A term often used by Islamic advocates)? Pamela Geller: Islamophobia is a propaganda term designed to intimidate people into fearing to resist jihad terror and Islamic supremacism. Breitbart News: Are you planning another free speech event in the near future? Pamela Geller: Yes, but we have no concrete plans as of yet. Breitbart News: Nadir Soofi’s (one of the shooters) Facebook page was rife with anti-Israel sentiments. Why is it so common to find that jihadists despise Israel? Pamela Geller: The Quran tells Muslims that Jews are their worst enemies (5:82) and are always scheming against Allah and the believers. They are accursed of Allah (9:30) and must be humiliated and disgraced (2:89, 3:112). So Jew-hatred is a religious imperative in Islam. Breitbart News: Do you believe the two terrorists were lone wolves, or were they part of a greater global jihadist network? Pamela Geller: One of them pledged allegiance to ISIS on Twitter before the attack, and ISIS, which has called for attacks in the US, is claiming credit. Whether or not they were in touch with ISIS members, they were certainly acting in concert with its goals.